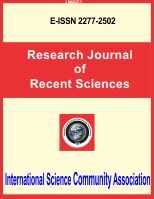 International Science Community Association are publishing an international peer reviewed journal Research Journal of Recent Sciences. It is the vision of International Science Community Association to publish research papers, research articles, review papers, mini review, case study and short commutations in all areas of human study without financial restriction. Coverage Area: Researches in the field of science such as Agriculture and Forestry Sciences,	Animal, Veterinary and Fishery Sciences, Biological Sciences, Chemical Sciences, Computer and Information Technology Sciences, Earth Sciences, Engineering Sciences (Civil, Cybernetics Electrical, Electronics, Mechanical, Textile, etc),	Environmental Sciences, Forensic Sciences,Family, Community and Consumer Sciences, Home Sciences, Humanity Sciences, Library Sciences, Material Sciences Mathematical and Statistical Sciences, Medical Sciences, Military Sciences, Pharmaceutical Sciences, Physical Sciences, Physical Education Sciences, Educational Sciences: For School Students, Women, Village and Society, Commerce, Law and Management related with Sciences, Anthropological and Behavioral Sciences: Sociology, Social Sciences: Researches in the field of Economics, Political Science, Geography, Drawing, Music, Dance, Philosophy, History and Languages concerning with science, Journalism and Role of Media in science, Role of NGOs in the protection of environment.